4.44 out of 5 based on 96 reviews. 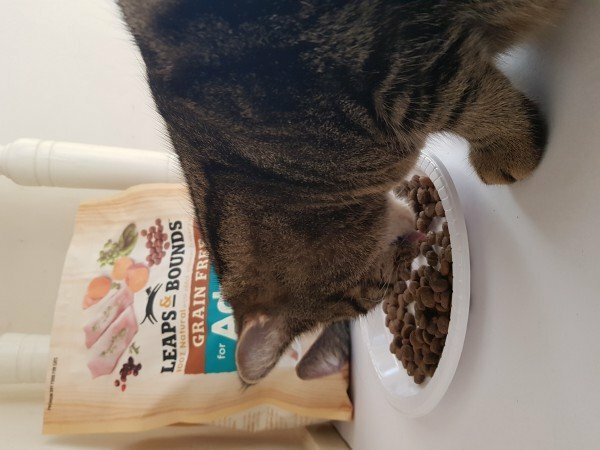 Every cat has their own personality and their own place in the family, that’s why at Leaps & Bounds we believe they should eat like a member of the family. Not by getting scraps off the table, but by eating nutritious meals full of all natural ingredients inspired by humankind, for Petkind. 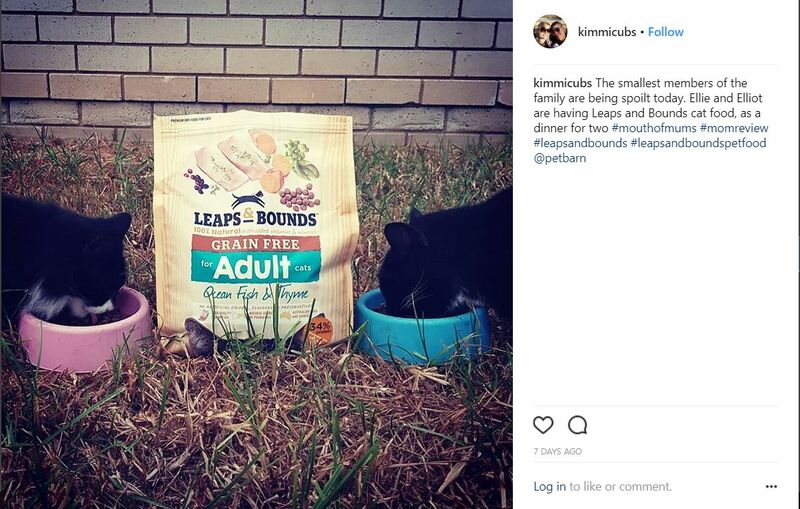 Leaps & Bounds cat food is a brand new pet food range on the market made with 100% natural ingredients sourced and made right here in Australia. 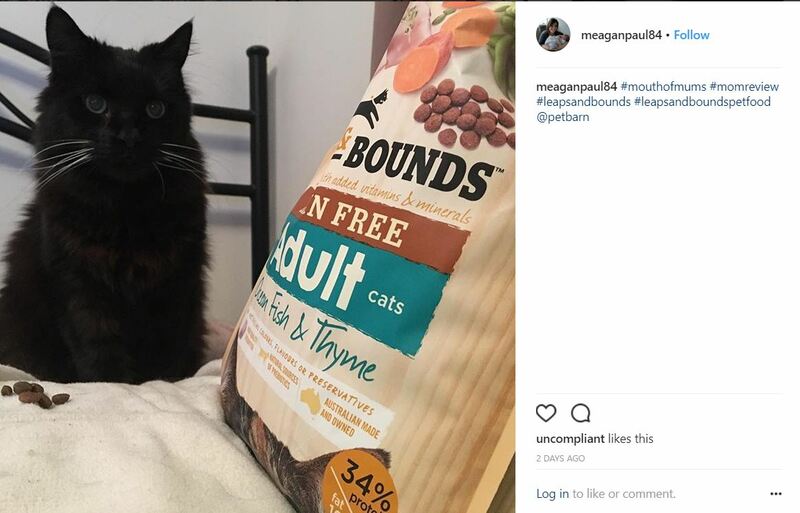 Jam-packed with real meat and veggies, Leaps & Bounds offers your cat complete and balanced nutrition all with a taste they will love. 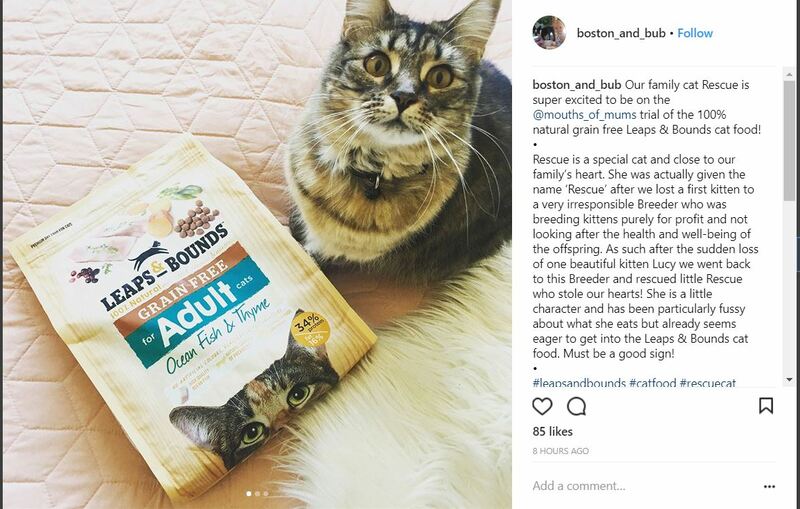 Right now, we’re excited to be giving MoM Members the chance to trial and review Grain Free Ocean Fish & Thyme Adult cat food with their feline fur babies at home. 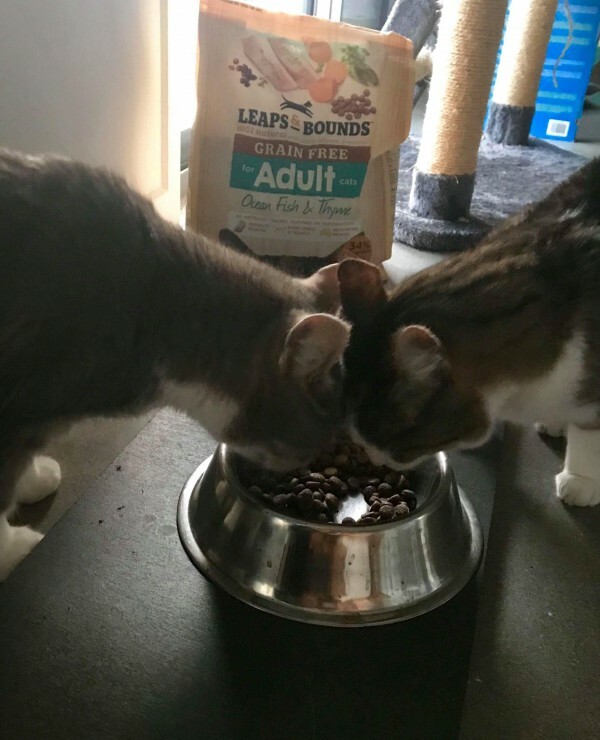 Leaps & Bounds was created after years of searching for the highest quality ingredients to create the perfect formula to provide all the nutrients healthy growing cats need without the hefty price tag. 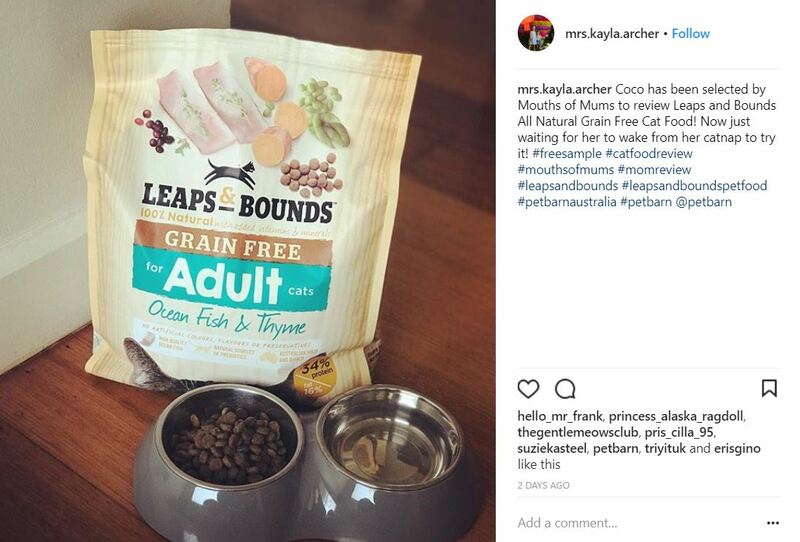 The Leaps & Bounds cat food range comes in a variety of sizes in both wet and dry food with delicious and nutritious flavours including Chicken and Rosemary, Chicken and Thyme or Ocean Fish and Thyme. 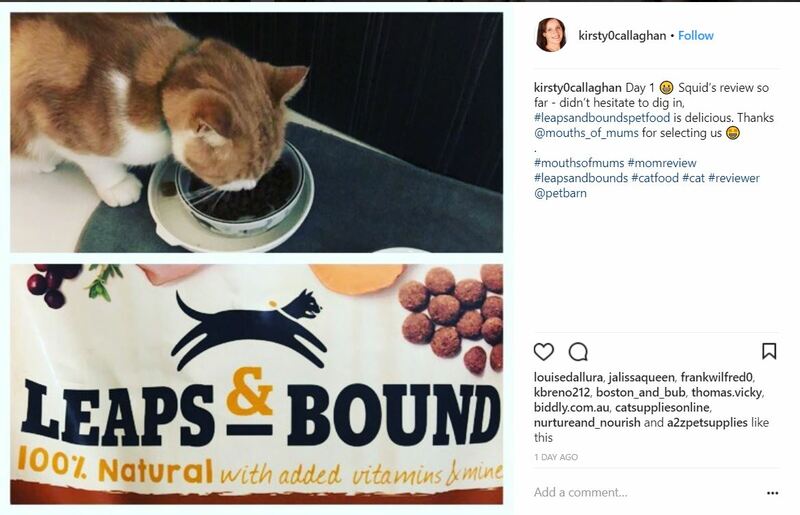 When feeding Leaps & Bounds for the first time, mix increasing amounts of the new food whilst decreasing the old food over a period of 7 days. The average cat eats between ½ – 1 cup of Leaps & Bounds a day. Where is Leaps & Bounds pet food available? 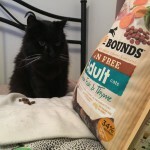 Would you like to trial Leaps & Bounds Grain Free Ocean Fish and Thyme Adult Cat Food? 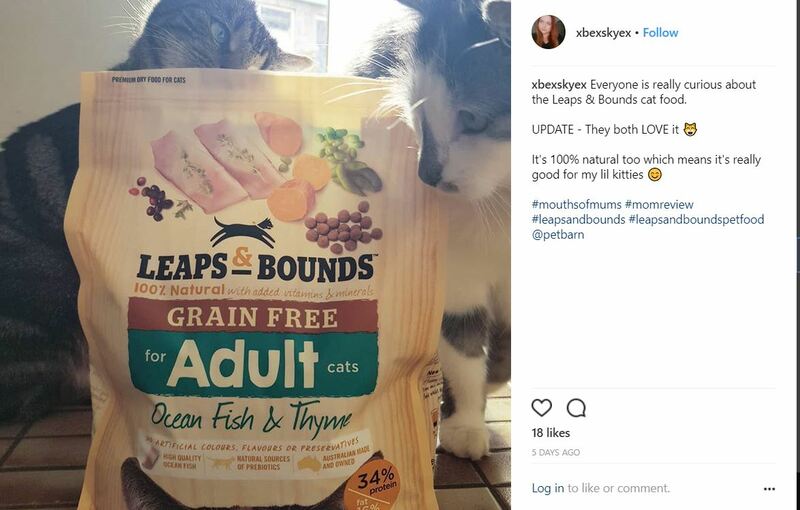 We’re looking for MoM Members with adult cats (12 months +) who’d like to trial and review Leaps & Bounds Grain Free Ocean Fish and Thyme Adult Cat Food. 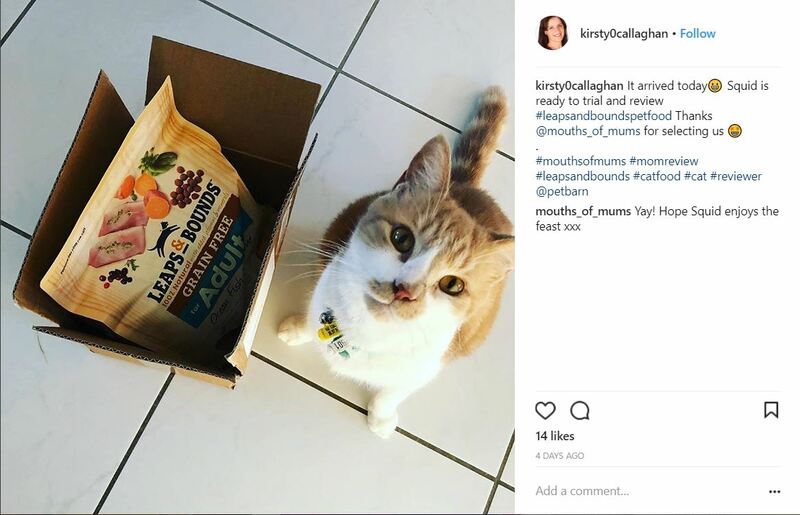 We’ll send a 3.2kg bag to you at home so that over the next couple of weeks, you can replace your current cat food with Leaps & Bounds and compare the results. 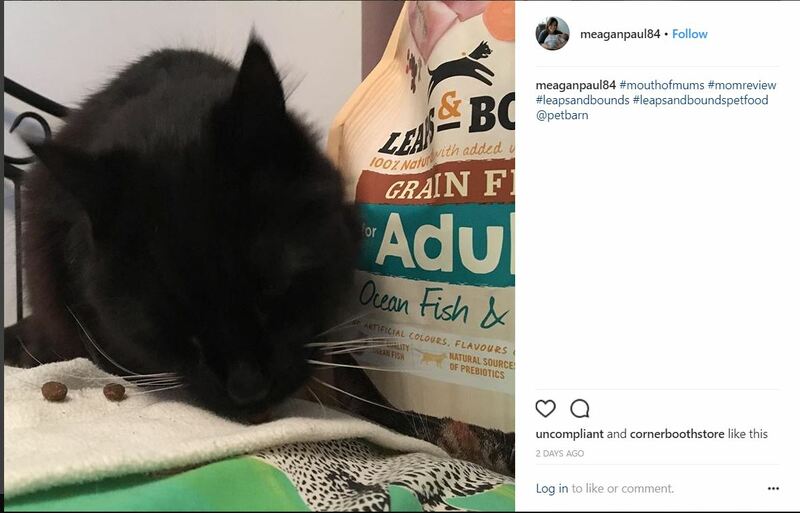 We’ll ask you to post at least 2 written reviews and star ratings on this page … and share pics of your fur babies with their new cat food on your socials. A special offer for family and friends! 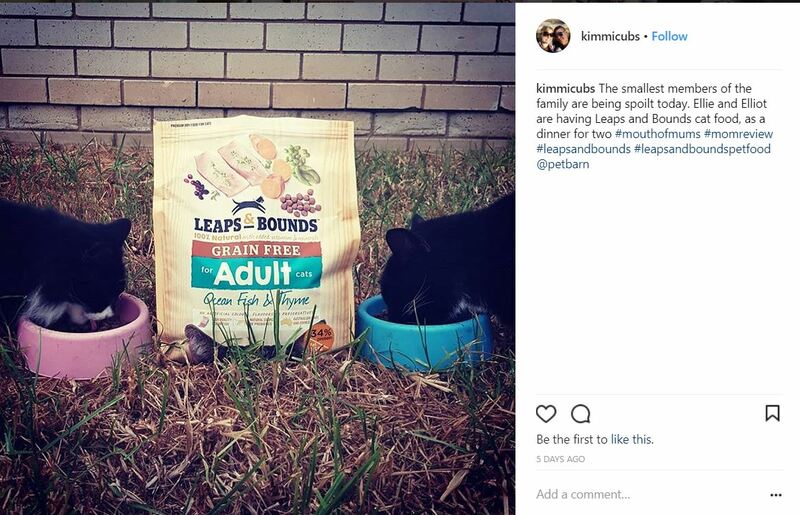 If you or your family and friends would like to try Leaps & Bounds today, simply take the below voucher to your local Petbarn or City Farmers store, or enter the promotional code AL1846V03 online at www.petbarn.com.au and receive 25% off any item from the Leaps & Bounds cat food range. Voucher valid until 31st July. Terms and conditions apply. Our cat is a picky pain when it comes to cat biscuits. He likes fish flavour, and only fish flavour. Found that out the hard way! He also manages to narrow to only one brand of food. 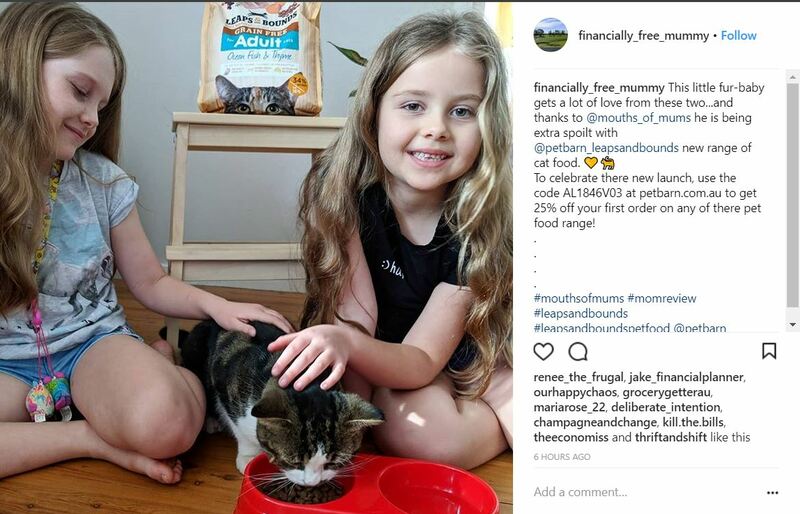 So I agreed to trial this cat food thinking I was most likely going to have to feed it to the dogs because the cat wouldn’t eat it. And you know what? He did! He loves it and has eaten it all every day. 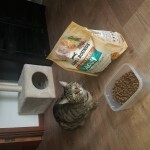 I am happy to give it to him, it is more nutritious than the other cat food he was eating. I highly recommend leaps and bounds to anyone who wants to give the best to their cat. My cat seemed to like this on better than other dry pebbles she is used to eating. I found the pebbles a little sticky which I guess it was meant to be opposed to the dry feel of the homebrands I usually buy for her. I will certainly look further into this product as a standard when the sample is finished. Being a fussy cat it pleases me that she lapped this one up. My very fussy Devon Rex wanted to eat it even as I opened the packet. He loved it so much that he put his paws up my legs and wanted more. This all in one round pelts have it all covered in both taste that he loves and a complete diet. We no artificial preservatives, flavors and colours you know that it is good for your cat. 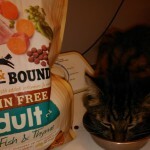 Leaps & Bounds, Ocean Fish & thyme is totally grain free and has added vitamins and minerals that are totally natural. 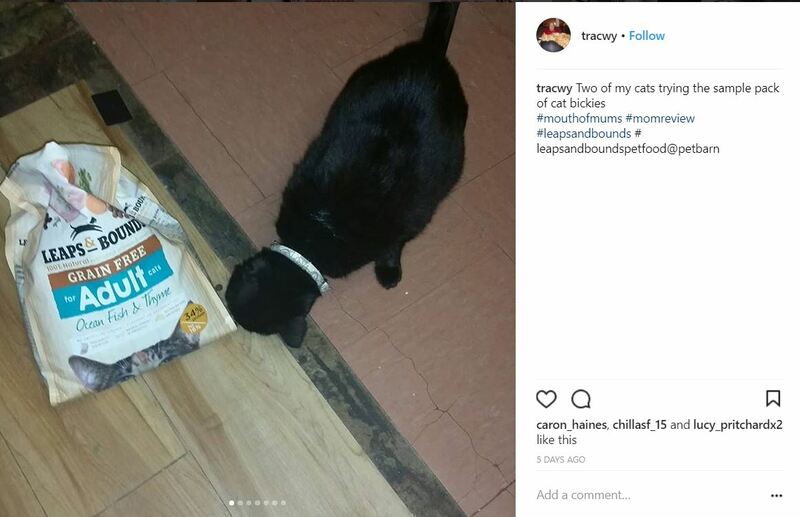 It is very easy to add to your cats diet by following the cup chart on the pack to slowly take your cat off his old diet and totally onto Leaps & Bounds. I put his daily amount into a plastic container as he loves it so much he likes to ask for more through out the day. He loved it from the first smell. All I hear is crunching! The cats have been loving Leaps and Bounds, normally they first eat the wet food given, but since trialing Leaps and Bounds, its crunch first wet later. Their coats look fantastic, and the smells from the litter tray are not as powerful as they are when using other brands. Well after my mum got over the fact the package was for me and not her, I was excited to try something new. I am not a big fan of cat food I do prefer human food much to my mums annoyance. So what is this she is giving me? Looks like me on the pack, thats a great start! Other stuff on there that must be for her to read. Miaow this is tastes nice, even to me, do they make this in pizza or cheese flavour? So far on the trial my cat has really liked leaps and bounds. 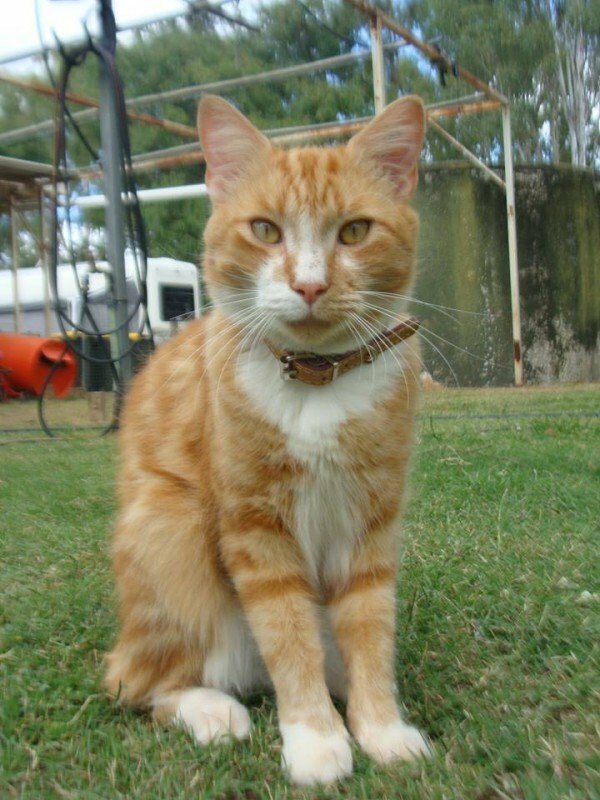 Hes a fussy cat with a sensitive stomach, so not as many vomits has been good. I’ve also found his litter box (fully indoors cat) is nowhere as stinky as it would usually be. So far so good 1 week in. 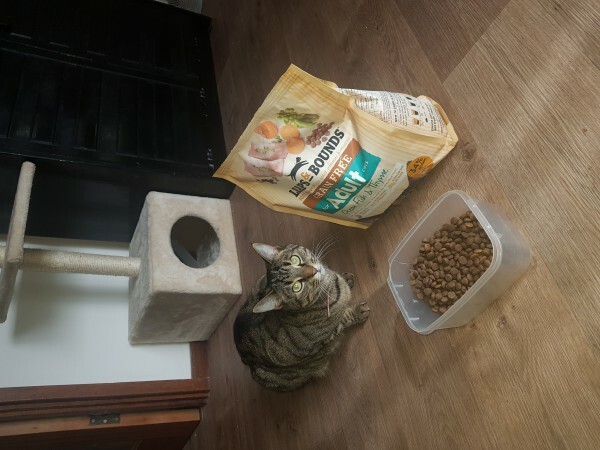 Iam surprised how much my cats love it as Thay are very fussy.I wound recommend to any one. 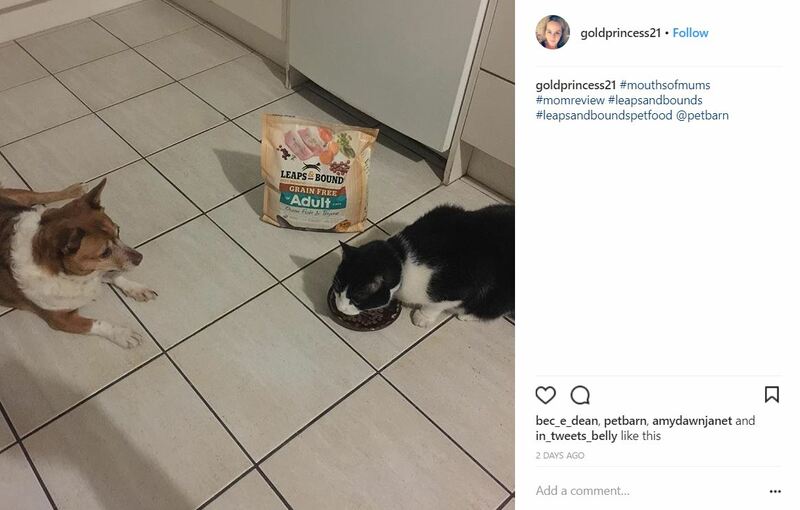 My cats loved it so much they opened the packet themselves. A+++rating from them. It\’s a nutritious meal for them and 100% natural. Go the ocean fish and thyme. The best thing is leaps and bounds contains no artificial colours, flavours or preservatives. I would give this food to my cats any day. Wow, what can I say. Our beloved queen Rosie who rules this house according to her could not eat the Leaps and Bounds biscuits fast enough. I have never heard her purr as much as she did while eating this & she was enjoying it so much that she scattered some on the floor in her haste to eat it. She came back a second time wanting more, as Rosie is known to turn her nose up at some cat food this is definitely a win. So far so good for a fussy cat! 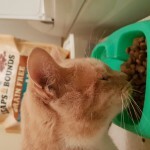 We recently tried the leaps and bounds cat food with our fussy cat Rescue. She was immediately enticed even to the packaging! She seemed to really enjoy the taste of the food and to our surprise finished it all. I am keen to see if it continues, but so far am very happy with the quality, taste and packaging of the Leaps and Bounds product. 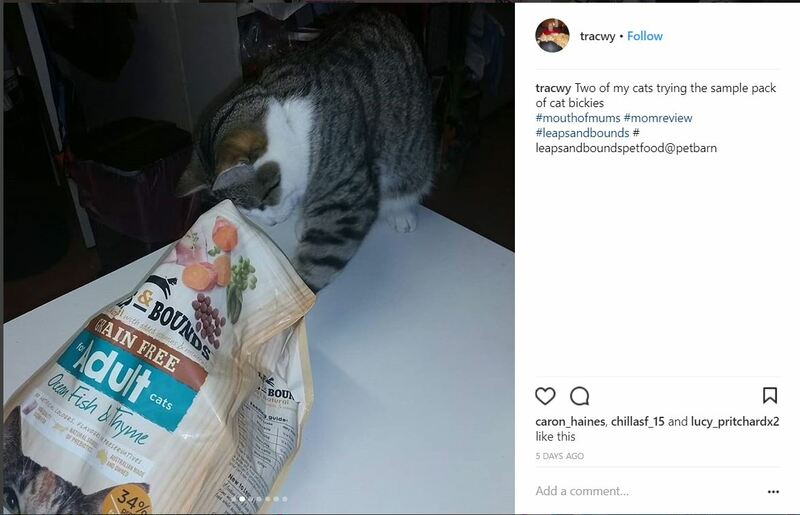 I had to ask my husband if the dog had gotten into the cat food as it had disappeared quickly, the cat must have enjoyed it! Packaging looks good (though not environmentally friendly). The food appears to be nutritious and similar in appearance to the whiskas food my cat is used to. Overall would use and recommend if the price is reasonable. Thanks for the opportunity to try. My kitty pumpkin was sniffing out the delivery box and sussing out the new smells before I even opened the bag! He is a super affection cat anyway and communicates his desires well: brushing up against my legs and pawing at me looking as adorable as ever he got leaped up when I said it was dinner time – and the serving was demolished within minutes – morning and night he has been eager and readily licking his whiskers ready for his tasty favorite new food! Thankfully there isnt any overpowering fishy smells even though the pellets are fresh and contain nothing nasty! 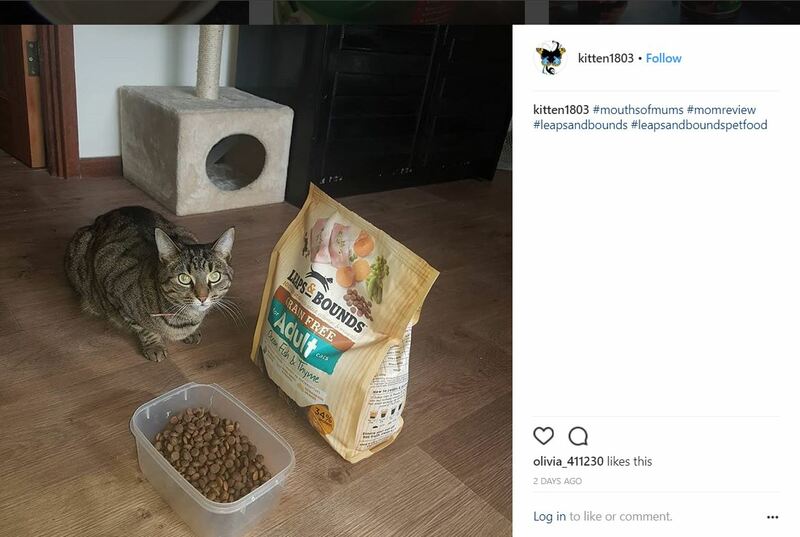 It’s evident to see that my cat enjoys this food so much. It’s obvious in the way he pricks his ears up when he hears me pick up the packaging. In the way his eyes track me across the room like I’m an oversized mouse bringing him his dinner. 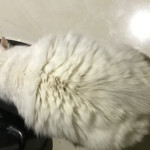 And it’s especially evident in the way my cat takes one look at his bowl, dips his hear in and barely comes up for air. When he finishes his meal, he looks at me with his green eyes and practically demands I pour more. 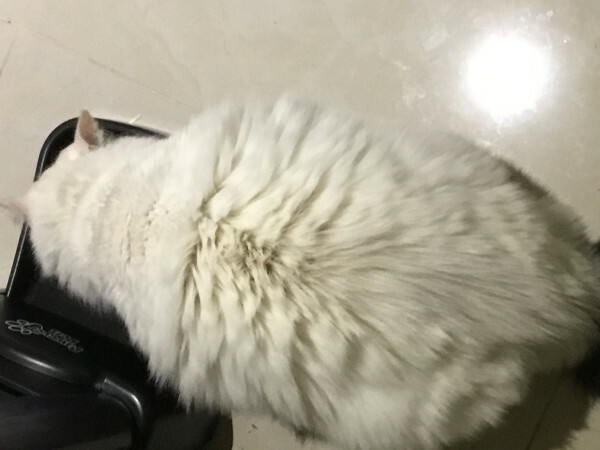 As a loving cat owner, I want to give my cat the best and that means a good diet with good food. And that’s something harder than it seems as some cat food looks good but when it comes down to it, there’s a lot of filler. Sp what I really appreciated about this food was the breakdown of the ingredients, an outline of the process and types of food Leaps & Bounds includes in their dry food. 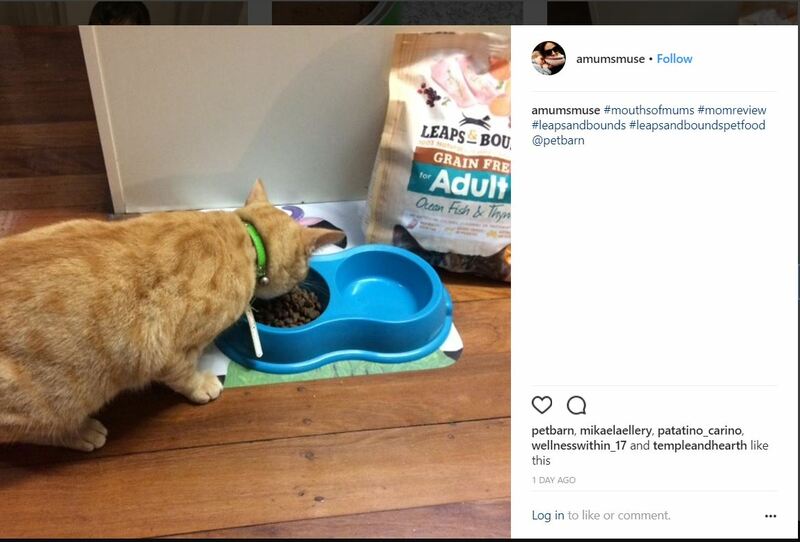 Makes me feel like I am giving my cat what he needs, a good diet of high quality food!! First of all, I was very impressed with the packaging. The colour, a buttery, beige suited the grain free claims on the packaging. 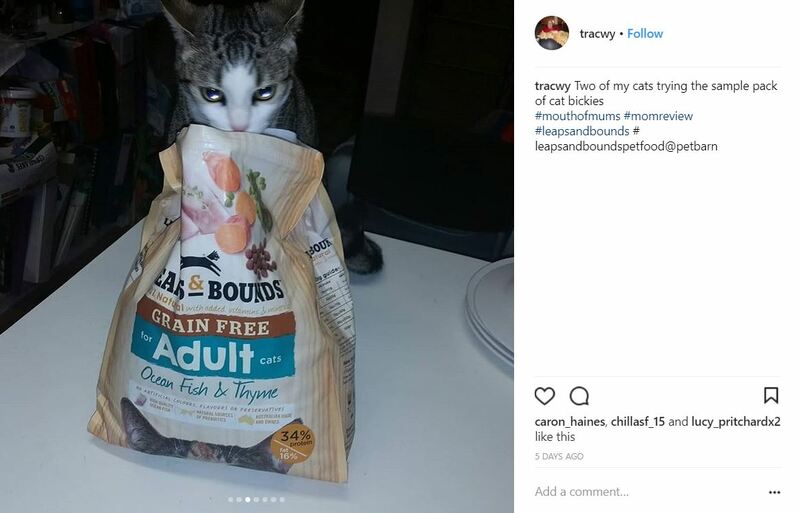 I liked the pictures of the protein (fish) as well as the vegetables as the very top of the page, along with a picture of the dry food. 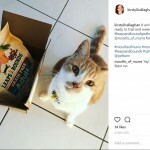 It was well presented and I thought it was clever to incorporate the food which was in the dry food, showing customers that they are feeding their beloved pet with ingredients which are good for them. The lettering on the packaging I liked as well, especially the picture of the black cat leaping over the & on the Leaps and Bounds lettering. Lots of pertinent information as well. 100% natural with added vitamins and minerals. Grain free. No artificial colours or preservatives. 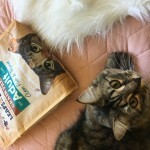 I look for these types of claims on packaging as I like to feed my cat high quality food. What really stands out is the blue lettering in the centre. My eye was drawn there immediately and above that the big GRAIN FREE claim. Despite having different lettering, claims, pictures etc, it’s not a jumbled mess and works well and is cohesive as an overall packaging. I particularly liked the cat’s head and ears at the bottom of the pack, that was a cute little addition. 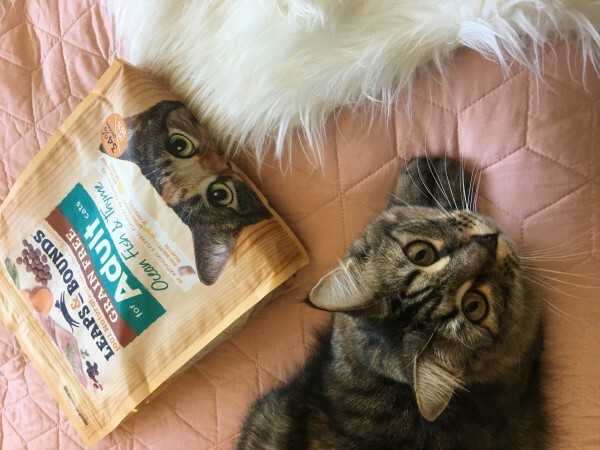 On the back of the packaging was more information which I found interesting and showed to me, as the consumer, that a lot of thought and research was gone into providing the best ingredients possible for my cat. 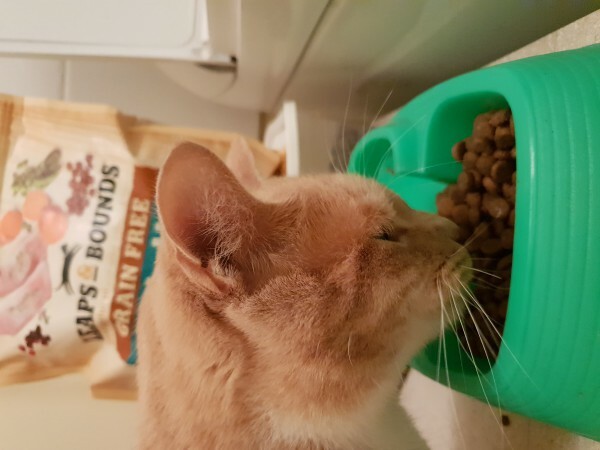 I liked the circle with the different foods included in the food, portioned up to show what exactly you are feeding your cat. The packaging itself was easy to open and I loved that I could use the zip lock to keep food fresh. The smell of the food isn’t overpowering and for cat food quite pleasant. 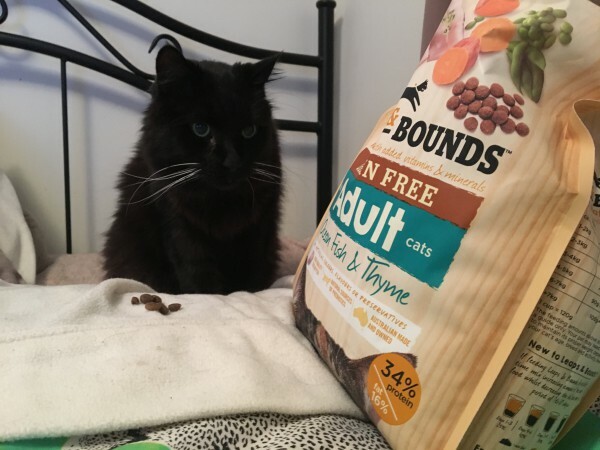 Some dry food I have opened has been a sensory overload, but this cat food doesn’t have a distinguished smell which makes it easy for me to feed. 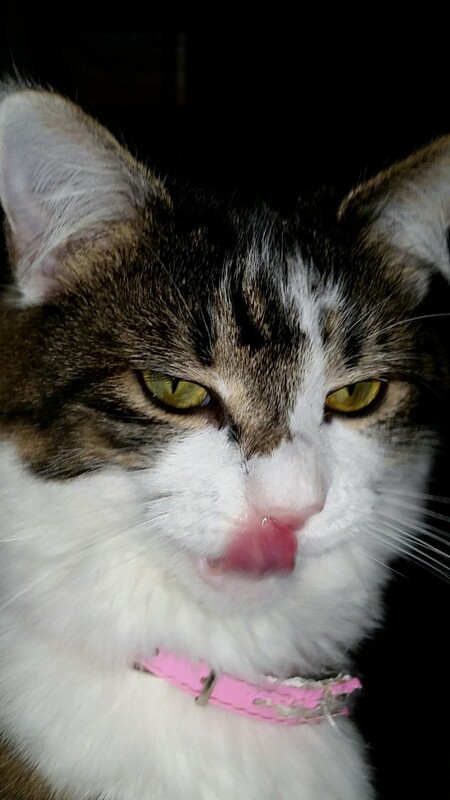 My cat LOVED the food. 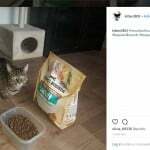 I found the dry food a little stickier than others when I handled but that didn’t affect anything, was just something I found irregular. My cat ate this food with such ferocity you could have been mistaken that he’d never been fed before. 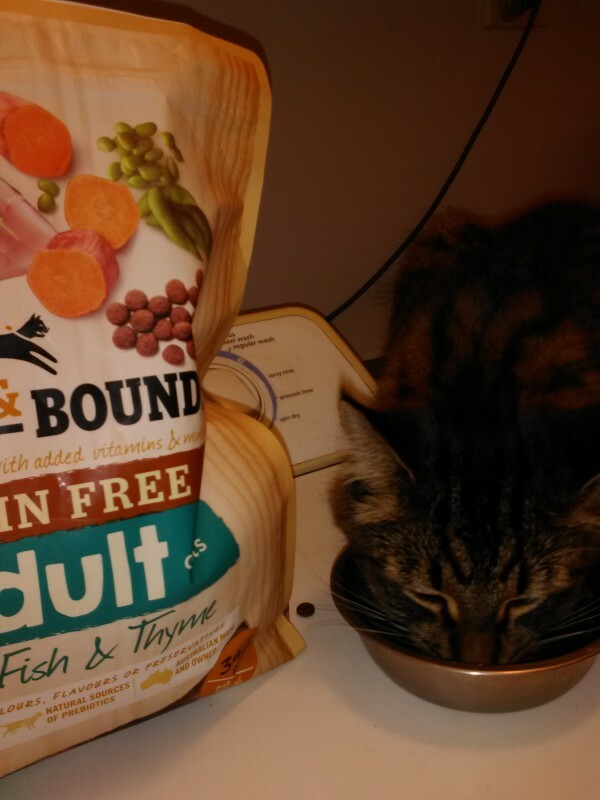 My cat Toby, loves fish tasting food and I could tell loved this dry food. 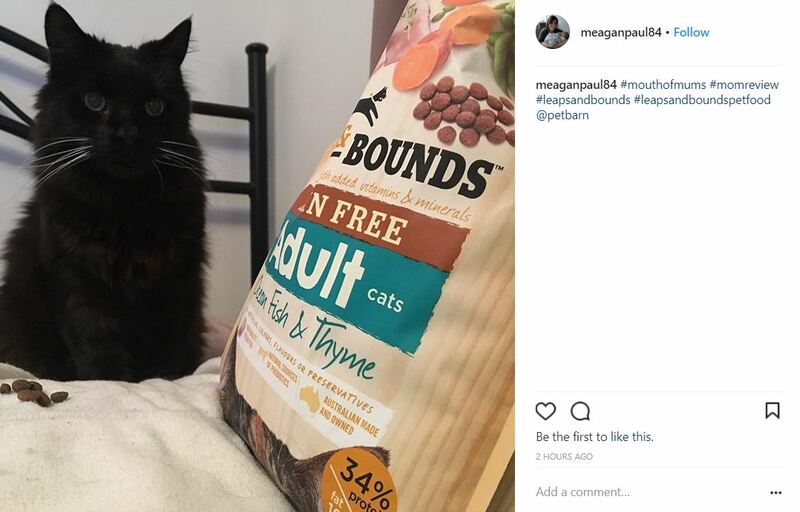 It’s great that my cat enjoys this food so much, and I will be buying it for him when I run out. But as an owner, I try to give my cat the best possible diet. What I really appreciated about this food was the concise, easy to understand/read information on the packaging. There was a feeding guide, breakdown of the food, an outline of what Leaps & Bounds stands for as a company, and an aesthetically pleasing packaging with an easy to reseal zip lock to keep the food fresh. Pasta on with our favourite pasta recipes!